The affordable alternative for air conditioners, air coolers have come a long way in the Indian market. There was a time when these air coolers were extremely big, instruments that were attached to everyone’s walls. But now, they are quite different. The olden air coolers that used to hang on walls have more or less disappeared and have been replaced by the new, more modern, portable and sleek in design air coolers. They come with multiple features and have infact, become a very good and suitable substitute for the air conditioner. Cooling capacity: Air Cooler, it’s use is underlined in the name itself. How effective can it be in cooling a room? Or, an office? Based on its power and your need, make a decision. Look at an air cooler’s, cooling area capacity to get a better idea of this. Power consumption: Although air cooler’s aren’t as heavy as air conditioner’s on the electricity bill, they still occupy a considerable portion of your electricity bill. In fact, electricity consumption has become such an integral part in such segments, that companies distinguish models on the basis of their electricity consumption. Size and portability: The USP’s of air cooler’s in comparison to air conditioner’s is that, they are predominantly portable while the latter isn’t. Of course, price competitiveness also proves to be a major factor but that’s a different issue altogether. Based on the size of your room, choose the appropriate air cooler so that you face none of the obvious difficulties of feeling too hot or too cold in it’s presence. 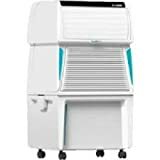 Capacity: 35 Litres; Ideal for room size of upto 200 Sq Ft.
We have also picked our own choices to give you more idea and information about top air coolers in India.Check the below list and choose one that can best serve you. Let’s look at the features that will help you make a decision. This model of an air cooler by Symphony Diet, has a capacity of 12 liters and a cooling area of, approximately 28/1000 (metre/feet). It comes with wheels, making it portable and it’s exact product dimensions are 30 x 33 x 84.5 cm. Because of the dura-pump technology, it’s quite long lasting and even in times of emergencies such as power cuts, it can work on an inverter, which is quite a handy feature. Apart from these features, it comes with a mosquito and dust net, auto louver movement, three different speeds: low, medium and high etc. Its power requirements lie at 230V and 50Hz, while it’s power consumption is 170 Watts. Slightly bigger than the model above, this one has its product dimensions set at; 64.5 x 44.5 x 42.5 cm. Despite it’s larger size, it uses just 130 Watts of energy and has a 20 litre capacity for water storage. Ideally, it’s perfect for considerably sized bedrooms and office rooms because of its power and large water storage capacity of 36 litres. At an average, it can expel air out at 1300 cubic meters per hour and it’s cooling area capacity is somewhere around 150 sqft. Despite all this power, it’s more like a sleeping giant, barely making any sound while in use. It comes with wheels as well, making it portable. Some care has been taken by Bajaj in designing this model. It is equipped with chill trap technology, four way air deflection and is compatible with inverter’s too. To make it durable, corrosion-free thermoplastic has been used as its prime material. A bigger version of the previous model by Symphony Diet in this list, this one has exact product dimensions of: 30 x 33 x 94.5 cm. It uses the same technology namely: Dura-pump technology. Some of the additional features are, mosquito and dust net, remote control, auto louver movement and a system restore function. The cooling are capacity of this model is slightly more than the former one, with this one being capable of covering 150 sqft. It runs on an inverter and if ever, the 22 litre water tank of it gets empty, don’t worry, you will be noticed by an alarm of some sort. For ideal usage, it requires anywhere between, 110-230V , while it itself uses, 170 Watts of energy. The second smallest in terms of both, size and capacity in this list, the exact product dimensions of this product are: 44.5 x 41 x 63.5 cm. It comes with a water level indicator and has an air flow capacity of 1200 cubic meters per hour. Like its capacity of 15 litres, its powerful air throw distance also, reaches a maximum distance of 15 feet. You can choose between the three set speeds of; low, medium and high. While it works on an inverter as well, it uses 155 Watts of power in normal circumstances. 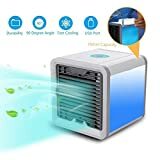 These are some of the best Air coolers available in India and can be bought from online as well .If you can afford money then it’s even better to go for an Air conditioner. 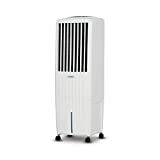 Based on your room size,usage and budget,you could go for 1 ton AC (Best 1 ton split AC from top brands in 2019 India) or 1.5 ton AC (Best 1.5 ton split AC from top brands in India 2019).